curates to fill the vacancies. The direct consequence of the outing of ministers was their illicit preaching in house and field `conventicles` that would eventually be deemed illegal and rebellious, with participants liable to instant execution if caught. himself what was going on. Covenanters, who declined to take the all ensnaring declaration and oath. The allegations and complaints against the curates were investigated independently by Lauderdale`s secretary, Sir Robert Moray. He concluded that it was impossible to support such ignorant and scandalous men “unless the greatest part of them could be turned out.” Moreover, it was not just in Scotland where the episcopal church was failing to support the people – similar, even stronger, criticism was being voiced in Ireland. and great grandson of John Knox). From the nearby parish of Keir the curate Bernard Saunderson brought armed supporters with him to fill Welsh`s pulpit, and was met and driven off by a barrage of stones thrown by a crowd of local women, led by a Margaret Smith, who had manned the walls of the churchyard. Here a William Arnot of Little Park drew his sword as he placed his back against the church door, declaring boldly “Let me see who will place a minister here this day”. of the action of the Covenanters. KIRKPATRICK-IRONGRAY Fasti vol 2 p 288.
entered on trials for license before the Presb. Of Haddington, 10th Sept.
Lang, min. at Newry, Ireland. 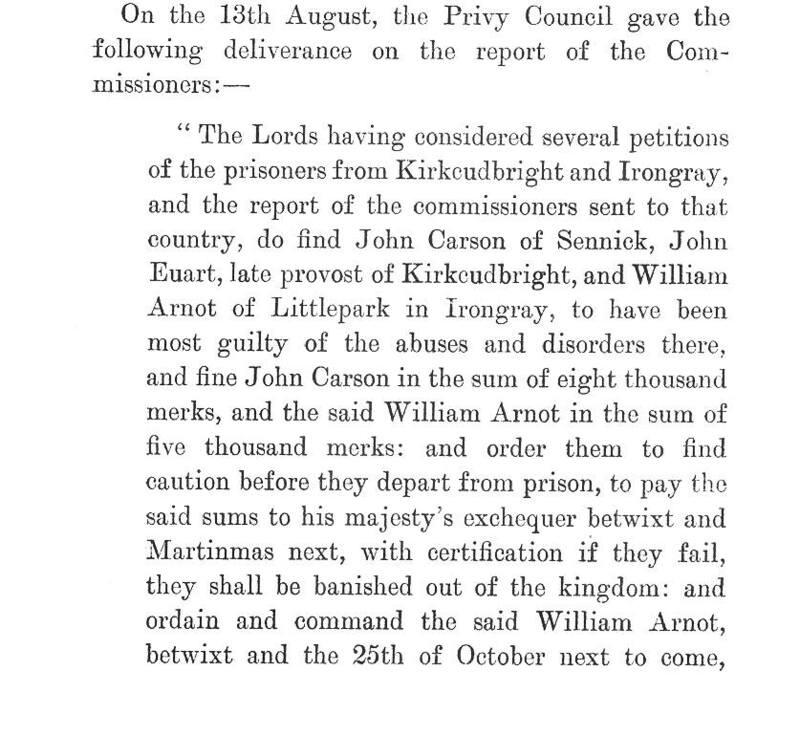 Subsequent investigation by Commissioners appointed by the Privy Council ( the Earls of Linlithgow, Galloway and Annandale, Lord Drumlanrig and Sir John Wauchope of Nidrie) revealed that Arnot had held several meetings opposing the interdiction of Saunderson and that he had refused the request of the Rev John Wishart to hold the women off. He was taken prisoner and removed to Edinburgh and an accomplice George Rennie of Beoch, was ordered to find security for his future behaviour. Meanwhile, the military were quartered on the inhabitants of Irongray till the following Monday. Arnot was fined 5,000 merks , ordered to stand two Sabbaths at the Repentance stool in the church, and ordered to be banished if he failed to pay. Another significant indication of unrest occurred shortly before in Kirkcudbright which was also investigated by the Commissioners. This involved the women of Kirkcudbright who objected to the curate John Jaffray of Monquhitter who had been `rabbled`. The Commissioners descended on the town in a huge show of force with 100 hundred horse and 200 foot guards, who immediately claimed claimed free quarters and generous pay from the local inhabitants. They then interviewed Lord Kirkcudbright ( an old friend of Archibald Johnston, Lord Warriston) who had opposed the appointment and declined to intervene in the disturbance. John Corsan or Carson of Senwick ( later a Provost) and John Euart or Ewart who had been elected a Provost but declined the post and refused to give advice about the disorder. They also interviewed some thirty three women, widows, and servants. They concluded that the three men and five women rioters should be removed to prison and trial in Edinburgh. A further fourteen women were removed to the tolbooth till they found caution (bond) of £100 sterling to appear before the Council when called. Some of the men went to prison instead of their wives. The Council subsequently fined Corsan 8,000 merks, Euart was banished. 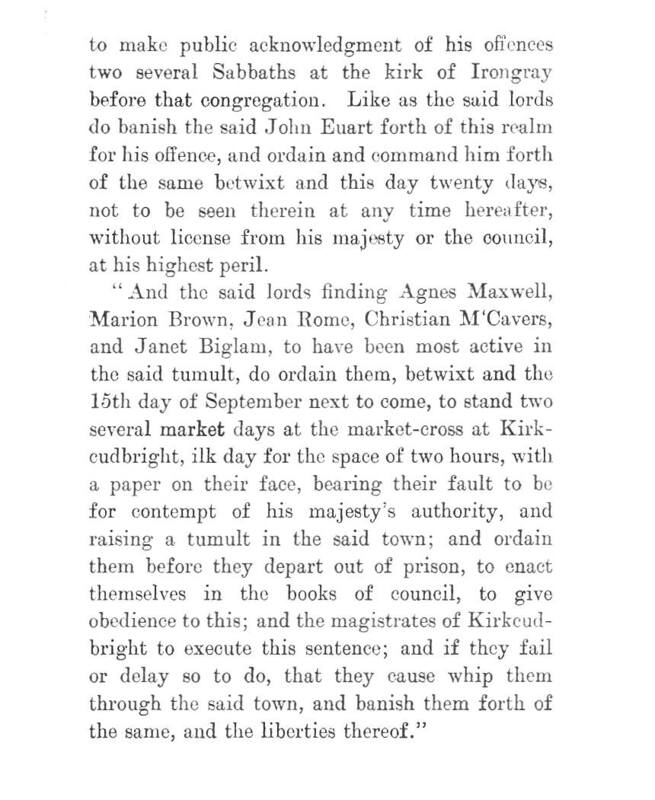 The five Kirkcudbright women – Agnes Maxwell, Marion Brown, Jean Rennie (or Rome), Christian M`Cavers, and Janet Biglaw (or Biglam), were ordered home to stand two market days at the Cross of Kirkcudbright with notices pinned on them stating their crime, and the magistrates encouraged to scourge and banish criminals if they tried to avoid punishment.